Turns your SMS-equipped laptop into a seismograph. Is there a better alternative to SeisMac? Is SeisMac really the best app in System category? Will SeisMac work good on macOS 10.13.4? 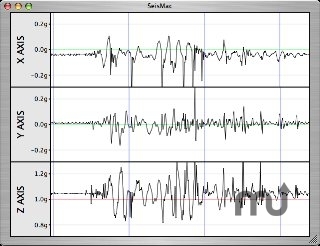 SeisMac is a Mac OS X Cocoa application that makes your MacBook or MacBook Pro (or SMS-equipped PowerBook or iBook) into a seismograph. It access your laptop's Sudden Motion Sensor in order to display real-time, three-axis acceleration graphs. SeisMac needs a rating. Be the first to rate this app and get the discussion started! When running on the MacBook or MacBook Pro, SeisMac has a range of plus or minus two gravities of acceleration, displaying 256 values per gravity, sampled two hundred times per second for each axis. SeisMac is also compatible with older Sudden Motion Sensor-equipped iBooks and PowerBooks.